Living with Stacy is a modern, slice of life comedy about the everyday routines and struggles of a young, happy couple. Join Ryan and Stacy as they attempt to comfortably coexist and push through life in hilarious and relatable ways! 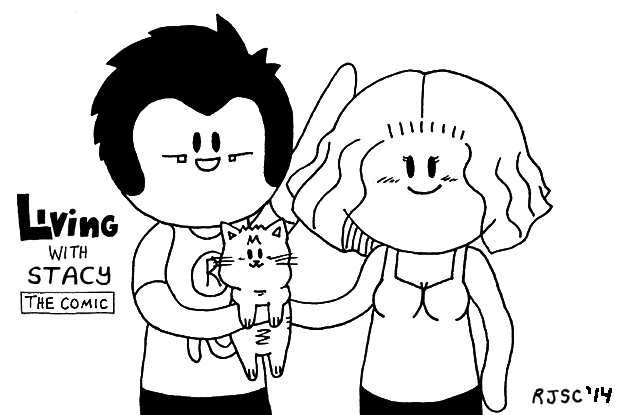 Hey there, I’m Ryan and I draw Living With Stacy the Comic. Let’s see…I created LWS in July 2014 and intended it to be a humorous take on my relationship with my wife, Stacy. Stacy of course, was (and still is) biggest source of inspiration as well as the struggles of living together as a young, happy couple. Yes, you can struggle and be happy at the same time. Haha. However, what sparked my initial interest in creating a comic centered around our relationship was what I call “The Banana Incident.” This incident was transcribed word for word in my LWS strip #01 – Banana. Suddenly, an overwhelming urge to share the ridiculum struck me, and that night LWS the comic was born! In August of 2014 I was approached by my local Newspaper and asked if they could publish Living With Stacy in the newspaper. I said yes and I’ve been excitedly drawing LWS comics ever since! So now you know a little about me. If you like my comic, why not leave a comment? Do it, it’ll feel good. President of Flapjack Studios, Ryan Chandler is also a writer, series creator, character designer, and story editor. A graduate of NSCAD University, he is trained in animation, film, screenwriting and the traditional arts. He has two kitties, Tori and Jeanie and loves to eat food (especially chicken).